Photo: "Come Sit Beside Me, Friend" by DdotG, member of the blogTO Flickr pool. 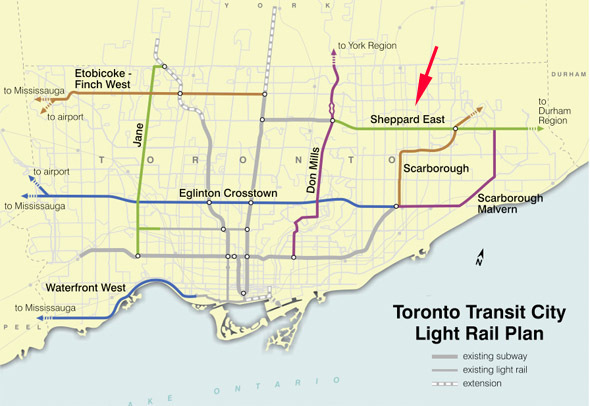 The next section of the Transit City LRT plan is under way, as the symbolic ground-breaking ceremony kicked off construction of the "Sheppard East Light Rail Transit line" (see map below). This one wont likely be a development story marred by thriving businesses suffering during construction, which is a good thing. Instead, it's likely a development story that's mostly ahead of the curve, accounting for future outward growth and densification of the city. Do suspected terrorists get preferential treatment in prison while they await trial? According to staff at the facility where they're detained, "special accommodations were made for [their] Muslim faith," they had better TV access, and were provided with laptops. With the exception of the TV upgrade, it sounds to me like they're being treated as they should be. Here's a controversial idea. Rather than encouraging us to not eat really crappy junk foods that are quite bad for us, Health Canada is looking into the possibility of having french fry and potato chip manufacturers add the cancer-fighting, heat-labile enzyme asparaginase to the product before cooking. In theory, this will reduce the quantity of the bad stuff (acrylamide) and not introduce anything harmful. Much to the delight of teachers (and perhaps some students, and perhaps some parents), Ontario is eliminating the fall report card for elementary students, meaning that graded evaluations will only come twice per school year (rather than three times). And despite firing Santa Claus (for allegedly handing out free candy canes to kids whose parents opted out of the pay-for-a-photo experience), the Parkway Mall is still seeing... wait, it was already seeing poor sales and shopper volume (according to some shop owners).